Earn up to 40 free spins now for playing the newest SlotsMillion game: Net Entertainment's Steam Tower video slot. 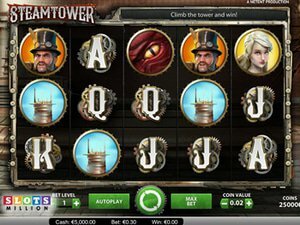 Net Entertainment casinos recently released a newest slot machine game, Steam Tower, and you can play it right now at SlotsMillion. This online slot features 15 paylines and an amazing steampunk theme that's unlike anything we've seen in any online slot to date. Everything in this title centers around the free spins bonus feature, and it will give you a chance to run up through the tower to save the princess and pick up huge multipliers as high as 7x along the way. But hitting the bonus feature isn't the only way to get free spins on this game at SlotsMillion. They're running an online casino bonus from February 25 through March 1, 2015 that will give you a chance to get plenty of free shots at this game. If you play a total of $10 for real money on this game during the promotional period, 20 free spins are going to be added to your account. Double that to at least $20, and your free spins double as well to a total of 40. These can be played on Steam Tower in addition to a wide range of other games including: Starburst, Piggy Riches, Tornado: Farm Escape, Flowers, Cosmic Fortune, Jack Hammer 2, Fruit Shop, Twin Spin and Go Bananas. What's more is that in true SlotsMillion fashion, you'll be able to play Steam Tower and cash in on this promotion no matter if you're playing on your desktop or if you're using a smartphone or tablet with their mobile client. Because SlotsMillion has well over 1,000 different slots to choose from, it's not really all that surprising that they have the newest titles right after they come out. With software from tons of top developers including Net Entertainment, Playtech and Microgaming, there's really nowhere else that can compare to the game selection of this online casino. For awesome promotions like this free spins package on Steam Tower and one of the best game selections in the history of the online slots industry, log into SlotsMillion right now.